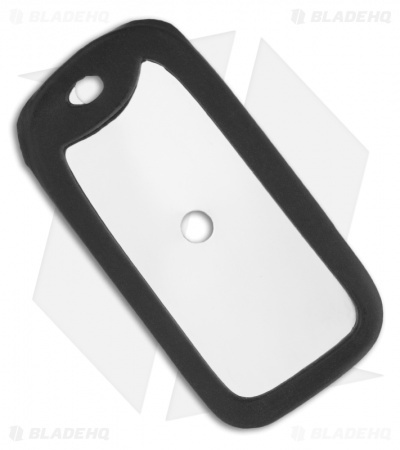 This TOPS Emergency Signal Mirror is ideal for neck carry (ball chain not included), stowing in wallet or bug-out bag. It's an American-made, hard chrome finished metal mirror with two highly reflective faces. Comes with a Rubber Silencer just like the Troops wear. The Emergency Signal Mirror is the perfect accessory and great insurance for all outdoor activities. Measures 2.15" x 1.00" and weighs 0.4 oz. The mirror is double sided. Good mirror. The second day i had it laying on my desk still from receiving it and the mirror punctured the rubber on the corner and is about to on a second one. The mirror on the edges are grinded to be rounded. So i think it would just rip another if i was to put another one on. The rubber appears to be chintzy compared to a set of dog tags.